The following review was originally written on the blog Sacrifice of Love. It is republished here with permission from the author. 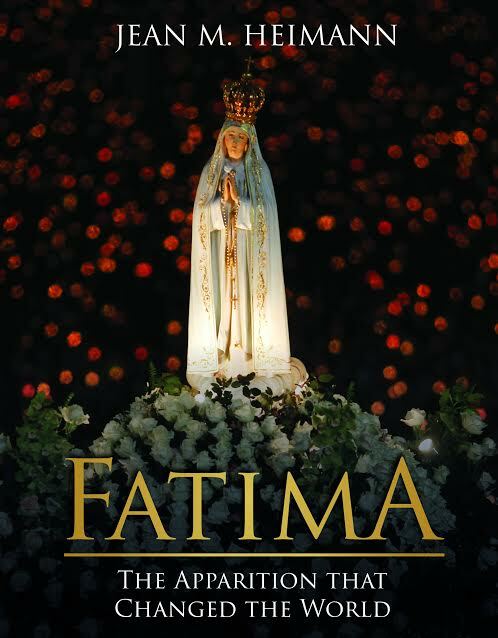 With depth and simplicity, Jean Heimann’s new book, Fatima: The Apparition That Changed the World (Tan Books 2017), instructs and inspires as it delves into the story of Our Lady of Fatima. However, instead of solely focusing on the apparitions themselves, Heimann provides a holistic view which shows the people and societal conditions that were so drastically affected by Mary’s appearances at Fatima. Heimann begins her work by introducing the three young children whom Mary appeared to: Lucia, Francisco, and Jacinta. She then continues to discuss the Marian apparitions that took place in 1917 and continue to be important 100 years later. Instead of simply discussing each apparition and then moving onto the next one, though, Heimann really dives into the messages of Our Lady. Following the scenes of the first two apparitions, she includes a “Lessons from the Apparition” section. This part of the book connects the faithful, humble “yes” that the three young visionaries gave to God with the fiat of Mary, the Mother of God. Heimann also explores Mary’s words, and how typical, “normal” lay Catholics can live out these messages. Instead of just throwing around terms like “reparation” and “Rosary,” she talks about what these aspects of the Faith are. I found the small section on the Rosary particularly inspiring as it discussed the importance of contemplation in this prayer. In discussing these apparitions, Heimann draws from Joseph Cardinal Ratzinger’s commentary on Fatima, which helps illustrate various symbols that were in the third apparition. She also provides the historical context of political events that were happening in Portugal at the time. Learning about these historical details was eye-opening, and helped me see how pivotal it was that Mary appeared in Fatima at this specific time period, and helped revive the Catholics there. After diving into the sixth apparition—the famous incident of the Miracle of the Sun on October 13, 1917—Heimann talks about the lives and deaths of the visionaries in the years that followed. I really did not know much about the events that followed the apparitions, and I was fascinated as I read about Lucia’s life in the convent. The book concludes by discussing the different popes who have visited Fatima, and some miracles connected to Our Lady of Fatima that have taken place in the years since the apparitions. 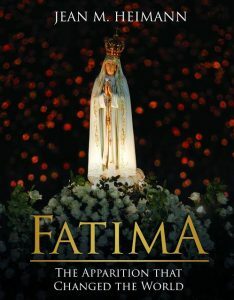 I really enjoyed this book, and think that Heimann did an excellent job crafting a well-researched, thorough resource on Fatima that is very approachable and engaging. Whether you are unfamiliar with Our Lady of Fatima or grew up watching the animated movie about Fatima, this book is a great read that inspired me. I found that this isn’t just a book about Fatima as an isolated set of Marian apparitions; instead, it shows us how Mary’s appearances at Fatima are part of the beautiful, rich tapestry of God’s work throughout the centuries. Fatima: The Apparition that Changed the World, by Jean Heimann, is available for pre-order at Tan Books and at Amazon. I received an advance copy of this book in exchange for my honest review. All opinions are my own. If you liked this book on Fatima, there is a whole spirituality that flows from this event. It is found in the book “To the priests, Our Lady’s Beloved Sons.” It is available at mmp-usa dot net. This book also is a profound commentary on the problems facing the Church in our times and is actually the best analysis I know of. St Joseph, “the just”, the craftsman, is the shadow of God the Father, Creator, protector and provider. He utters no word in the gospels; even as everything God the Father has to say is uttered in the Eternal Word made man in Jesus. St Joseph is not only head of the Holy Family, but Patron and protector of the Universal Church. That’s us. “Go to Joseph” Pharaoh said in the Book of Genesis to those who sought food in time of famine. “Go to St Joseph” in these times of spiritual famine; he will protect you from evil and provide food, clothing, and shelter to those who love his wife and adore his divine step-son. So he (St. Gabriel the Archangel) came near where I stood; and when he came, I was frightened and fell upon my face. . . They were both alarmed; and they fell upon their faces, for they were afraid (of St. Raphael the Archangel).